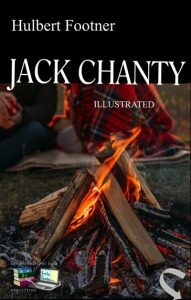 Jack Chanty had to guide an expedition through North and different camps (Sapi Indians, Camp Trangmar, up to fort Sheever and on). Who had robbed the Bank of Canada, Montreal? Adventures and romance are waiting for you! TOWARD the end of the fourth day the pack-train wound down a hill to Fort Geikie, and they saw the great river again, that they had been following all the way, but at some distance from the bank. Fort Geikie was no more than a couple of log shacks maintained during the winters as an outpost for trading with the Indians. At present the shacks were boarded up, and the Indians ranging away to the north and the west. The prairie came to an abrupt end here, and immediately before them rose the steep foothills, with the mountains proper looking over their heads behind. Around a point off to the left the river issued foaming from between grim, hewn walls of rock. Up and down river it was called significantly, “Hell’s Back door.” “Hell’s Opening,” it followed, was at the other end of the canyon. For upward of twenty miles between the river roared down in unchecked fury, grinding the drift-logs to shreds. The log shacks stood in the middle of another grassy esplanade, but here elevated high above the river. The party camped on the edge of the steep bank, with a lovely prospect visible from the tent openings. The river was swifter and much narrower here; far below them lay a thin island, and beyond, the river stretched away like a broad silver ribbon among its hills, the whole mellowed and glowing in the late sunshine. As soon as the horses were turned out Jack made his way to Sir Bryson. The governor led him into the tent. “Let me see,” said Sir Bryson. Producing a paper from his pocket, he spread it on the table. Jack saw that it was a handmade map. “The lower end of the canyon,” he repeated to himself. “That will be here,” and he put his finger on a spot. Jack’s natural impulse was to walk around the table, and look at the map over Sir Bryson’s shoulder. As he did so. Sir Bryson snatched it up, and held it against his breast like a child whose toy is threatened by another child. Jack, with a reddening face, retired around the table again. Sir Bryson reddened too, and murmured something indistinguishable. Suddenly it came to Jack that he had seen the map before, and a smile twitched the corners of his lips. Since Sir Bryson wished to make a great secret of it, all right — he. Jack, was not obliged to tell all he knew. Sir Bryson did not see the smile. He was studying the map again. “How far is it to the top of the canyon?” he asked. “Did you tell him what they were?” asked Humpy, all agog. It was impossible for Jack’s spirits to remain permanently depressed. Tonight, after a long silence, the banjo and the insinuating baritone were heard for a while by the fire. At the sound, Linda, in the big tent, changed colour. The ladies still dressed for dinner as far as they could, and Linda, with her elaborate hair arrangement, the pearls in her ears, and the rings on her fingers, made an odd urban figure to be here on the lonely plains. Her attention wandered, and finally she committed the capital crime of bridge. They changed places, and Linda carried her chair outside the door of the tent. The cook-fire was only some twenty paces distant, and she saw Jack in his favourite attitude, the small of his back supported against a log, and the banjo across his thighs. The admiring Humpy Jull sat on the other and of the log, whittling a stick.